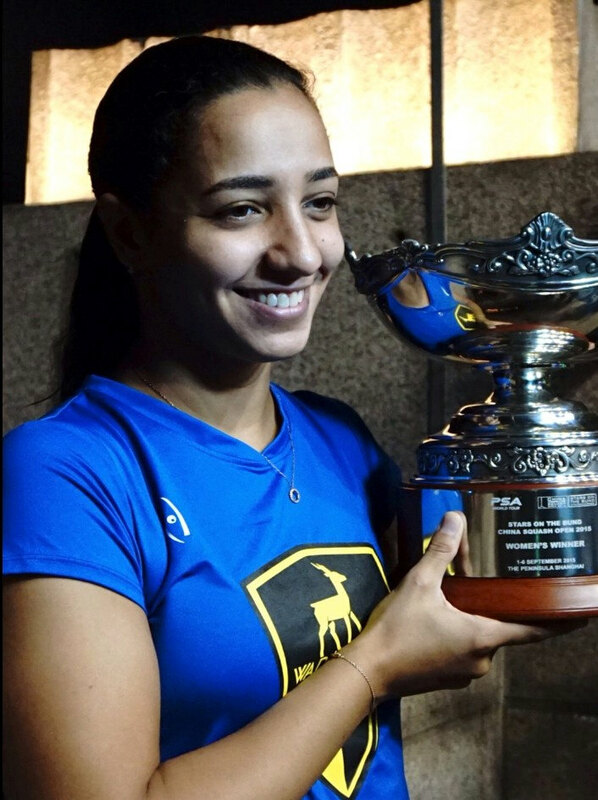 New world number one Raneem El Welily collected the first major title of the new season as she beat compatriot Nouran Gohar, the world junior champion who had already beaten the world #2 and #3 on the way to the final, in straight games at the Peninsula Hotel on the Shanghai waterfront. In the men's final second seeded Frenchman Gregory Gaultier ended the run of undeeded Marwan Elshorbagy with a convincng three-nil win. 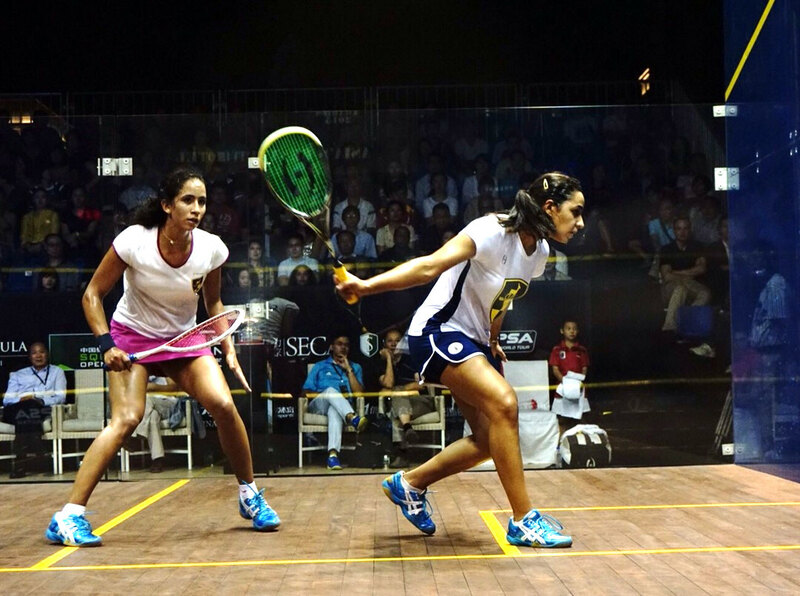 A match between two Egyptian women, and you didn't feel that the pace slowed down from yesterday's Shorbagy v Mosaad men's semi-final - quick movement, fast reaction, powerful shots and drives. Gohar made most of the shots, low, short, powerful, the typical teenage way - you give her an opportunity she will hit it as hard as she can - and those tough shots gave Welily lots of trouble throughout the match. Welily is much more calm and experienced though, she responded with high quality drives, very tight to the wall, and for the money shot her choice wasn't limited to drop or shots but a high quality lob, and a soft but perfect angle crosscourt. For the whole match, Gohar actively won most of her points, but also made at least half of Welily's points by unforced errors. 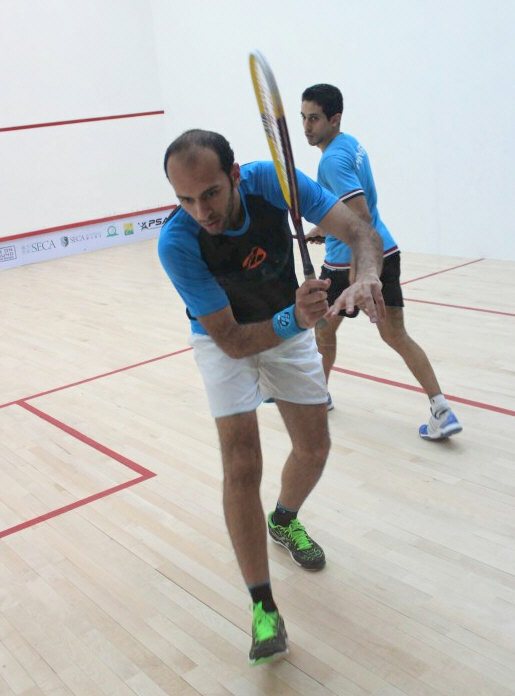 “I’m very glad with how I started the season and how I was focused and steady throughout the tournament,” said El Welily. In the men's final Marwan contested the opening stages well, but from 4-all in the first game Gaultier took control, leading 8-4 and taking the game 11-6. In the next two games Marwan was for the most part following Gaultier's lead, and there was little propsect of more miracles being created today. 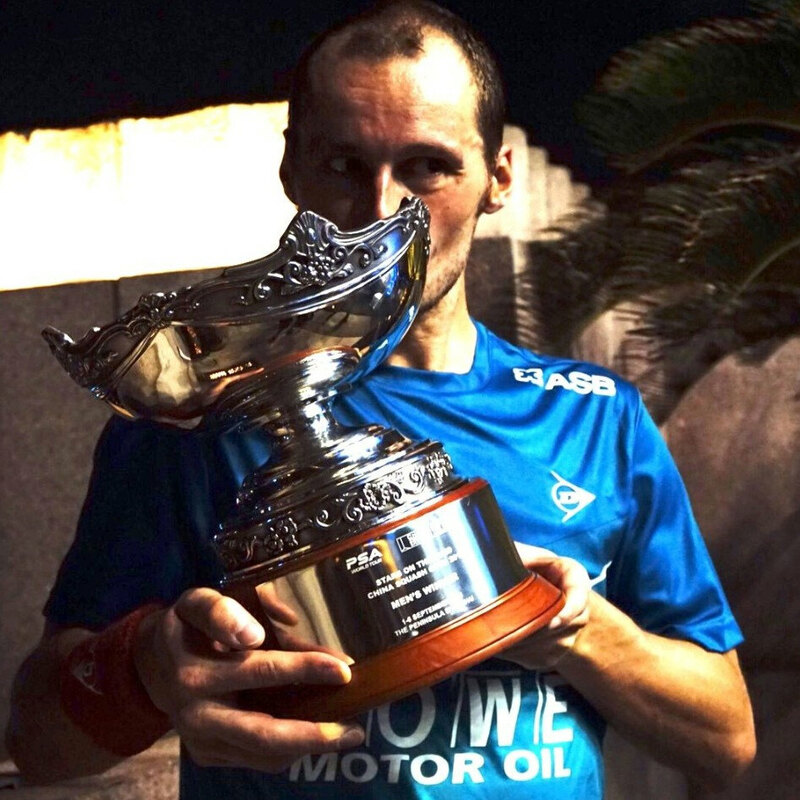 “I’m very happy to win the first tournament after the summer training break,” said Gaultier. 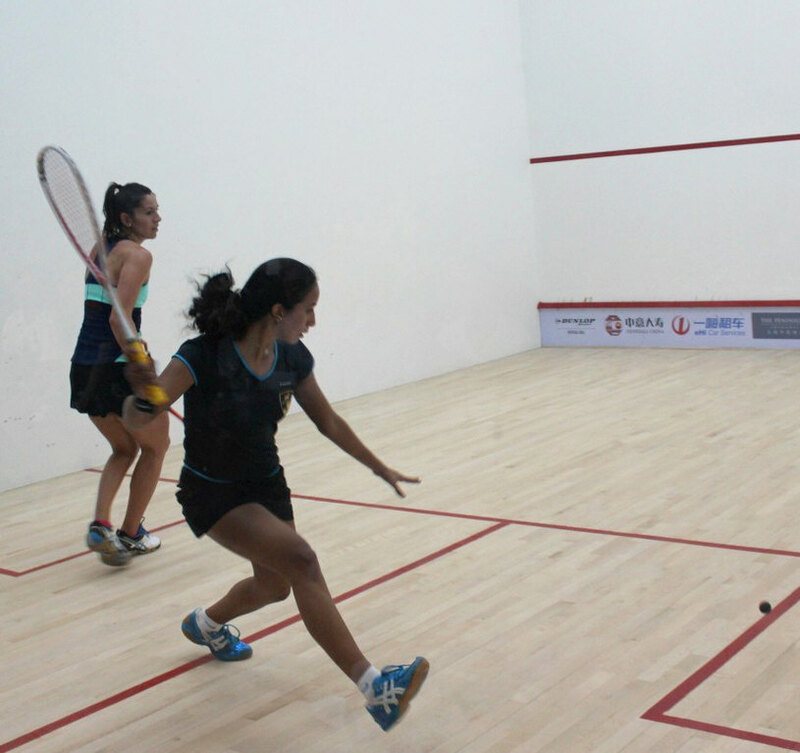 Matches between players from the same country do not always connect, but although 18 year old Nouran Gohar lost 3/0 to World No.1 Raneem el Welily, she gave a good account of herself. After beating Nicol David and Camille Serme on successive nights, it was expecting a great deal of such a young player to win the title. 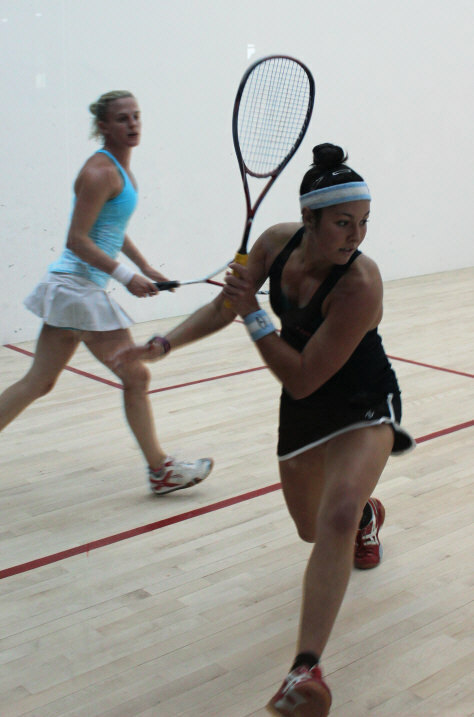 The first game maybe proved decisive: Welily led 10/7, but Gohar forced a tiebreak and served for the game at 11/10. Ultimately, although, it was Welily who won the game 13/11. 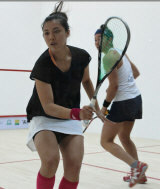 She then took a 5/1 lead in the second game, before Gohar recovered to 7-all. It was not enough, though and aided by a couple of Gohar errors, Welily led 2-0, 11/7. At 6-all in the third the World Junior Champion was still in contention, but Welily's experience told and two winners took her to 10/7, then 11/7 and the Women's China Open title. 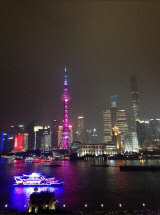 A good way for Welily to celebrate her elevation to World No. 1. For Gohar there will be other days - lots of them. 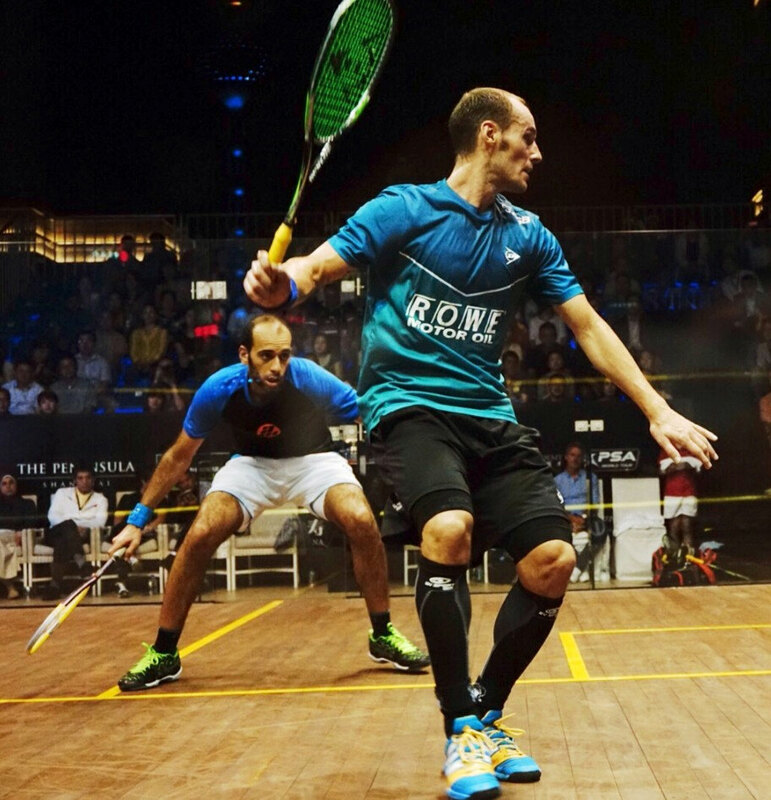 Apart from a class difference, and Marwan el Shorbagy's late night exertions in the semi-final, it seemed unlikely that he could extend Gregory Gaultier, the World No.2, who had reached the final unscathed. rSo it proved. Gaultier led 10/4 in the first, won the game 11/6 and took the second with ease. Shorbagy was certainly feeling the physical pinch after the previous night's antics, and had te audacity to ask for the count to be swept at 7/1 when clearly under pressure. Gaultier won the second 11/2 and moved effortlessly to 10/2 in the third. 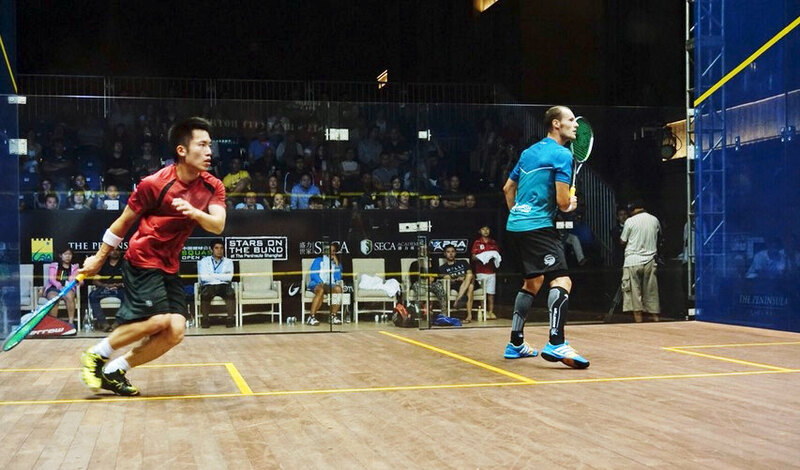 A stroke and a winner brought Shorbagy back to 10/4 but the win was soon Gaultier's 11/4. 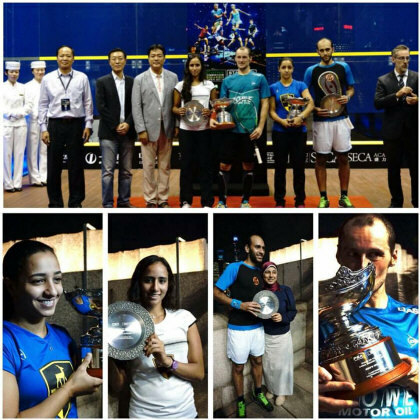 Gaultier will be well pleased with his start to the new season and Shorbagy equally happy to have reached the final. 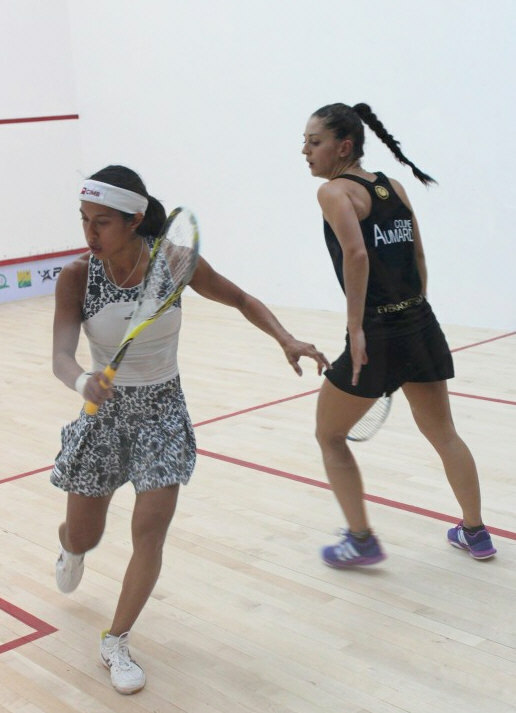 New world #1 Raneem El Welily was the first player to reach the finals, with a straight-game win over American fourth seed Amanda Sobhy. 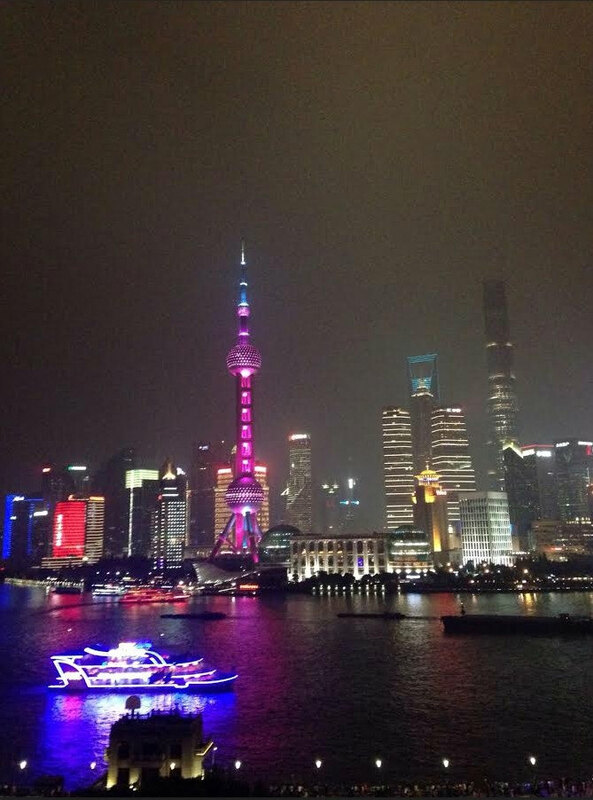 The match went as you might have expected,” reports Chris Wang on the spot in Shanghai. Raneem was in control for the most part, drilling in drops and volleys with Amanda doing most of the running trying to reach the Egyptian;’s shots. Amanda put in some good drop shots herself, but Raneem was reacting so fast. It was a fast, clean match with only a handful of decisions needed. Sobhy tweeted: "Well that was a short lived time on the glass. 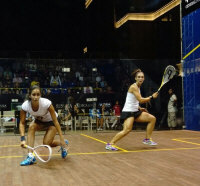 Raneem too good plus I need to get used to playing in extreme humidity." 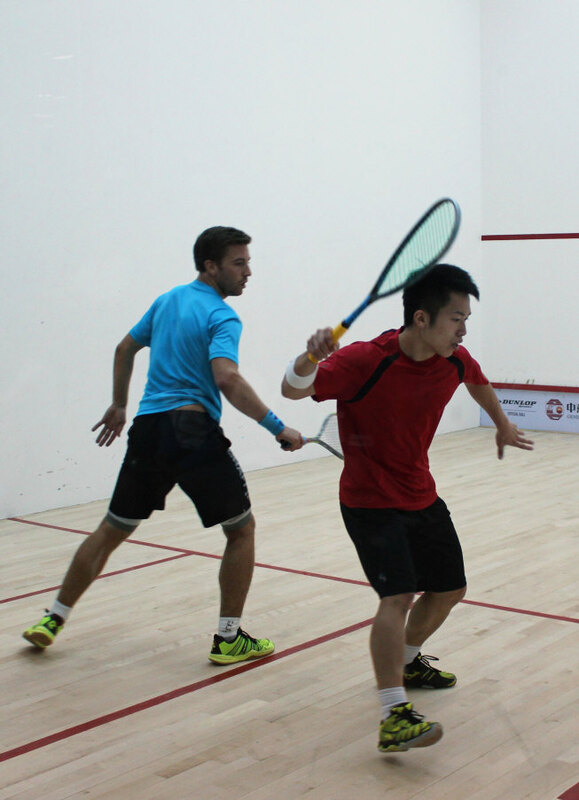 Next up was France's Gregory Gaultier against Leo Au, the Hong Kong qualifier who had already beaten James Willstrop, Simon Rosner and Mathieu Castagnet. There would be no upset this time though, in tyhe only one of today's matches not to feature an Egyptian, as the second seed won in straight games. The match started with long rallies and lots of play deep in the court with both players playing patiently, feeling each other out. At 6-5 in the first Leo tried to be more aggressive but made four errors in a row. "For the rest of the match Greg was in charge with Leo purely defending and struggling to make any impact. 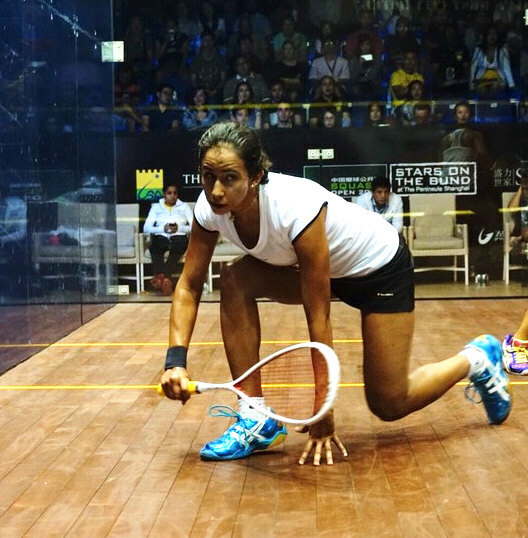 An all-Egyptian women’s final was set when Nouran Gohar followed up yesterday’s win over world champion Nicol David with another stunning upset, beating world number three Camille Serme in straight games. Gohar was amazing, hard to believe she’s only 17, such a strong mindset and so calm when behind. Serme had opportunities in all three games, the first two going to 8-all but Gohar getting the final points in both. In the third Serme made some unforced errors to give Gohar match ball at 10-6, she saved two but couldn’t stop the Egyptian from taking the match. The final match of the day was an all-Egyptian affair and provided another upset as unseeded Marwan Elshorbagy beat fourth seed Omar Mosaad in a marathon five-setter, played out in front of a diminished crowd. Shorbagy was not really up to the pace of the match during first game, but he returned in the second as both players adapted to the court and started playing more aggressively. 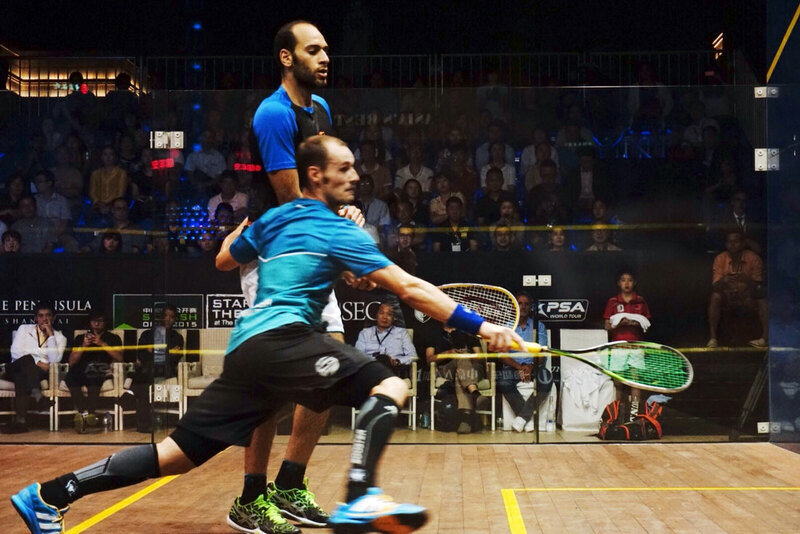 It was point for point until 9-all, then Shorbagy won last two points with awesome winners. In the third game, both players became more patient and conservative, many drives and long rallies, Shorbagy started to challenge the referees, and more body contact occurred between the players, almost every point need 2-3 calls to settle. "Shorbagy got game point at 10-9, Mossad got to 10-10, but Marwan took the lead 14-12. Win or die, in the fourth game, with no way out, Mossad started being super aggressive at the beginning, volleys and volley drops, he is all on fire, with Shorbagy become more and more upset with referees, who became noticeably stricter towards the end. Mosaad led 7-4 and closed out the game 11-8. 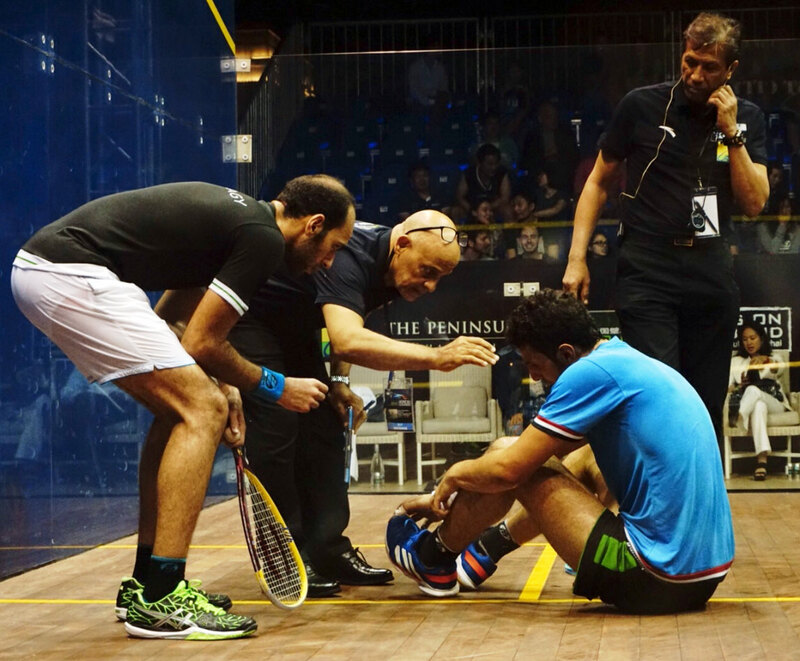 The last game was quite dramatic, at 2-1, Mossad was hit on the nose by Shorbagy's racket and the game had to stop for 10 minutes for the doctor to stop the bleeding. When Mossad was leading 8-7 , he fell suddenly, screaming with pain. He tried to get back to game twice, but couldn't recover from leg cramp, and after around five minutes the chief referee announced that Mossad had retired from the match. 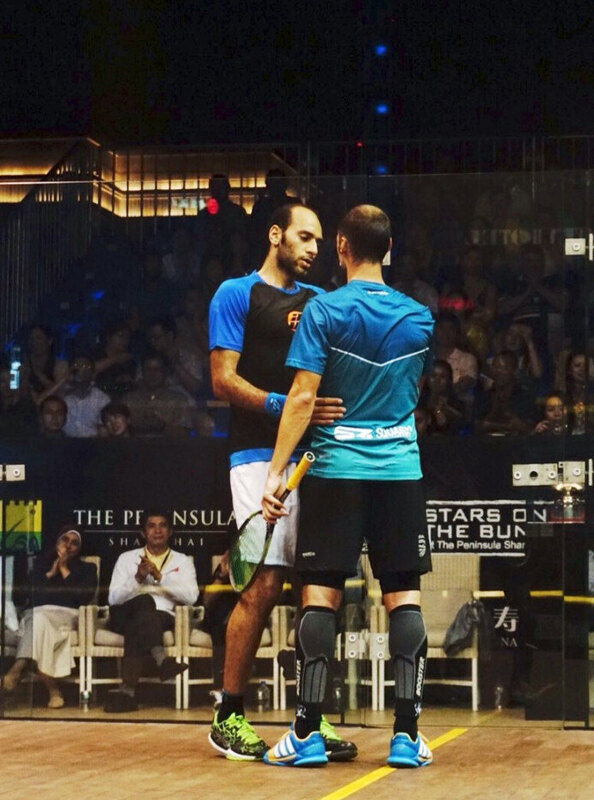 Marwan tweeted: "What a match that was! 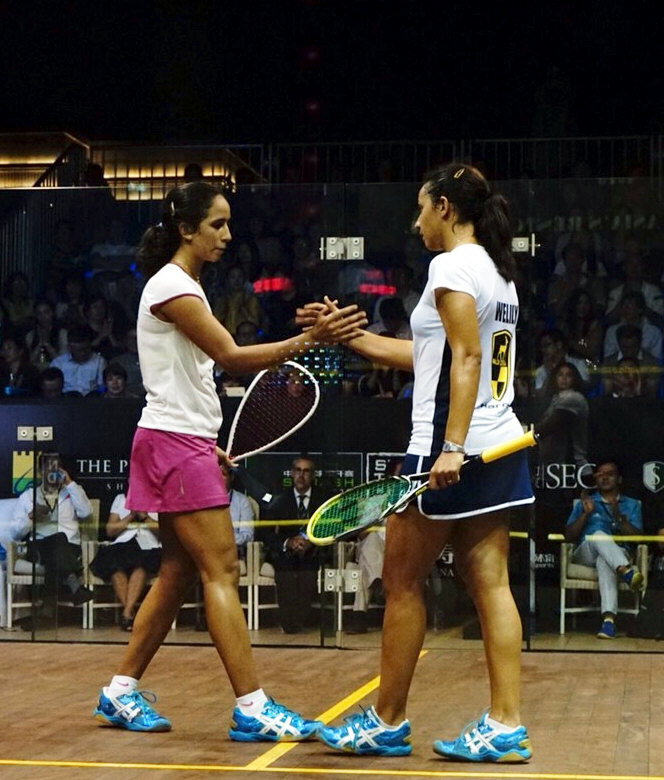 The toughest and longest match I have played in my career so far, unfortunately it had to end that way though." If anyone had predicted a semi final line up without Mohamed el Shorbagy and Nicol David, they would have been thought to be deranged. But that is how it is. From day one of the qualifiers, the championship has seen a series of surprises and shocks, but the semifinal matches are still full of interest, especially the women's matches. World Junior Champion Nouran Gohar looked good in Shanghai last year and last night's win over squash great Nicol David was outstanding. She will take on British Open champion Camille Serme in a match which can hardly fail. Raneem El Welily plays the gifted Amanda Sobhy and this too promise much. 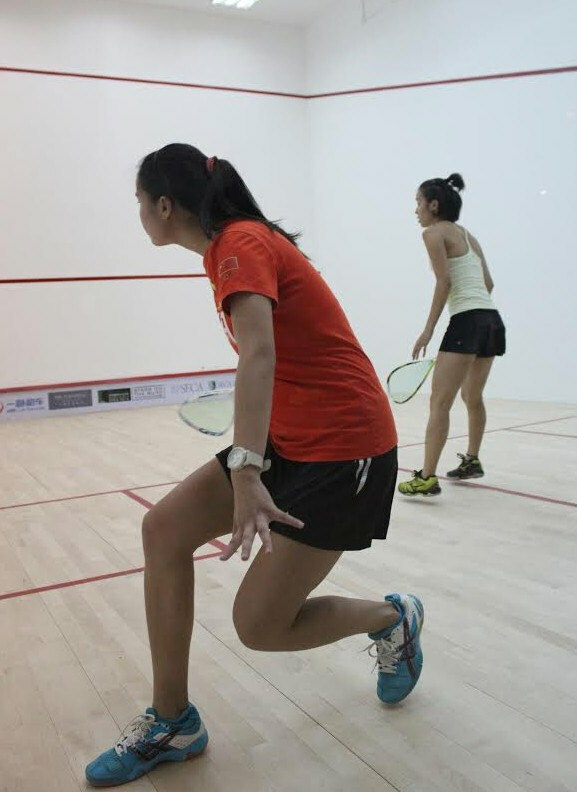 Both girls are supremely skilled and will appreciate the glass court. As for the Men's semi finals Marwan el Shorbagy, who did what Mohamed failed to do in beating Max Lee convincingly 3-0, plays fellow countryman Omar Mosaad, whilst Gregory Gaultier faces giant killer Leo Au. 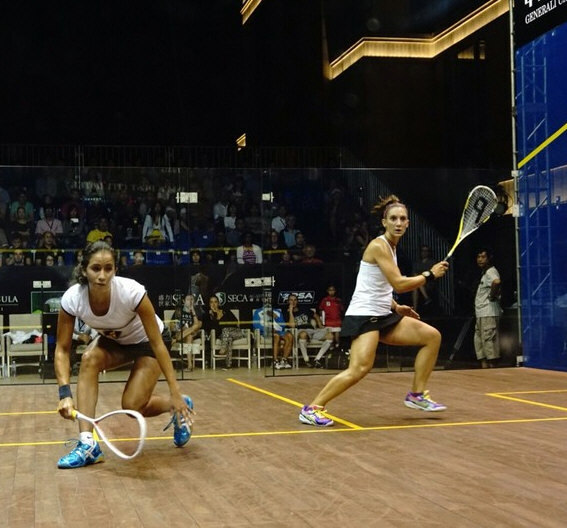 New world No.1 Raneem El Welily and Amanda Sobhy opened proceedings on The Bund on semi finals night, a fascinating prospect between two gifted racket players. Welily began in characteristic easy rhythm, and quickly established 5/1 lead with controlled length and clinical finishing, winning the opening game 11/5. She led again 5/1 in the second, maintaining the same relaxed smoothness of racket and movement, taking the game by the same score. 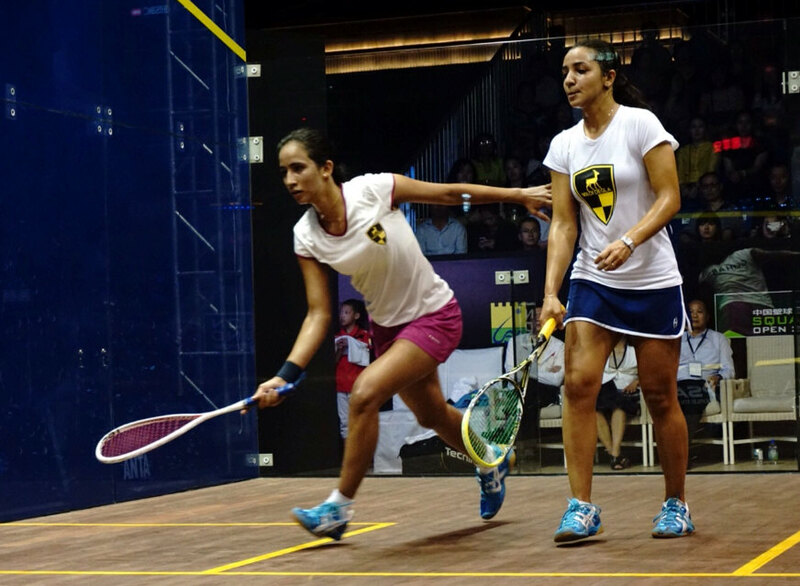 She led 6/3 in the third, but Sobhy was persisting and even managed to lead 7/6. She battled all the way, threatened to win the game, but Welily edged it 11/9. It was an impressive display by the World No.1 and she will be difficult to beat on this showing. Leo Au must wake up wondering if he has been dreaming: he has beaten the 2014 China Open Champion James Willstrop, German No.1 Simon Rosner and French No. 2 Mathieu Castagnet in succession. 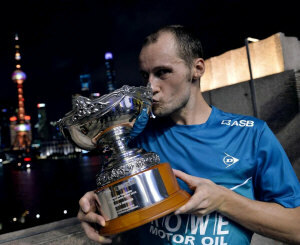 Now an even more daunting prospect: world no 2 Gregory Gaultier, and it proved a match too far, understandably enough, for the Hong Kong player. In truth Gaultier controlled matters from beginning to end, not to say that Au was in any way disgraced. He gave all he had, and his three previous matches must have taken a lot out of him. 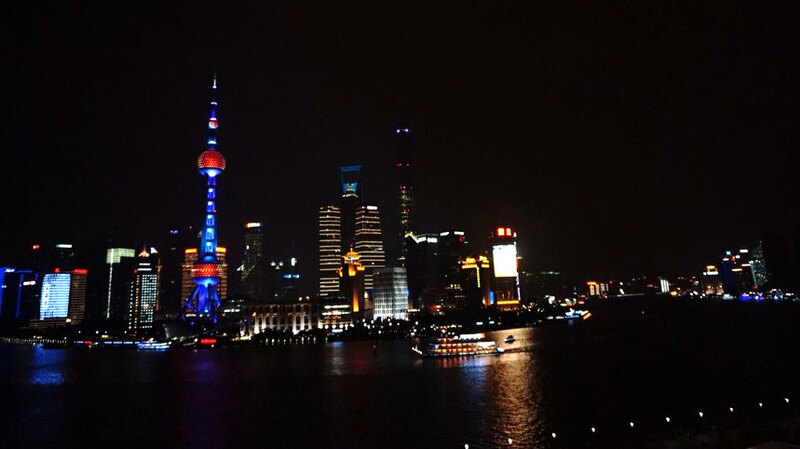 He can and will look back with pride on what he has achieved in Shanghai. Gaultier looked in fine form and will not be easily beaten. After Nouran Gohar's marvellous win over Nicol David in the quarter final, could she repeat the dose against British Open champion Camille Serme? The answer is that she could, and did, winning 3/0. None of the games were easy, as might be expect when opponent is Camille Serme. It was 8-all in the first game before Gohar asserted to win it 11/8, her power and range of shot making the difference. The second was even closer. Serme led 7/3 but Gohar clawed her way back. A winner at 9-all gave her a game ball and an error from Serme the game 11/9. It was hard to imagine there was a way back for Serme with Gohar playing as she was. 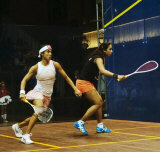 She took control at six all in the third and won the match 11/8. It was another superb performance for Gohar, who, if it is possible to come of age so young, she has. 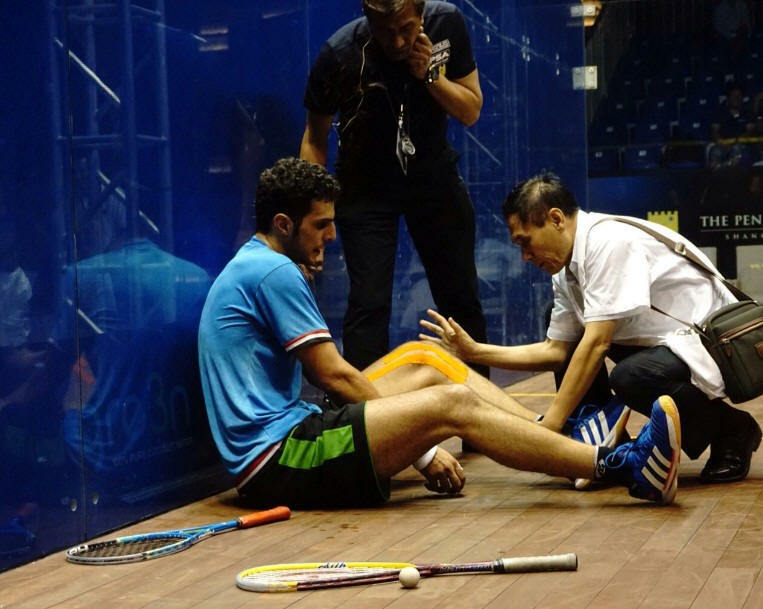 It might have been expected that it would be Mohammed el Shorbagy who would feature in the semi-final, but it was younger brother Marwan who faced fellow Egyptian Omar Mosaad. 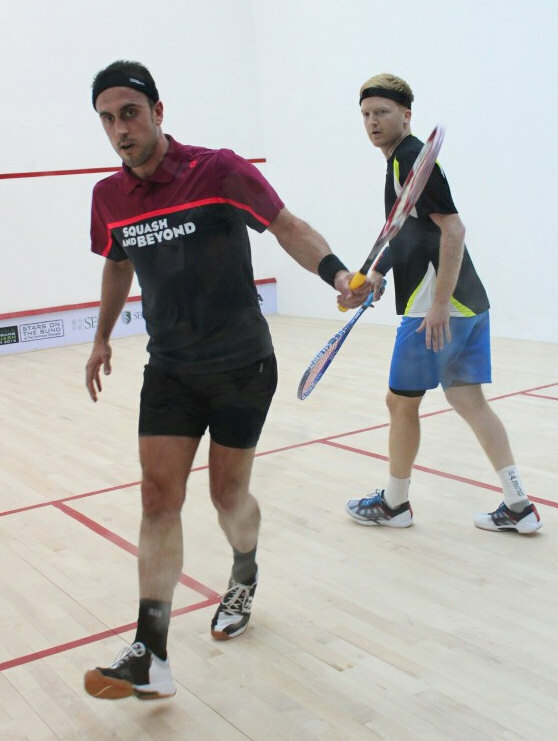 It was Mosaad who had much the better of the first game winning it comfortably 11/4. The second game was a different matter. 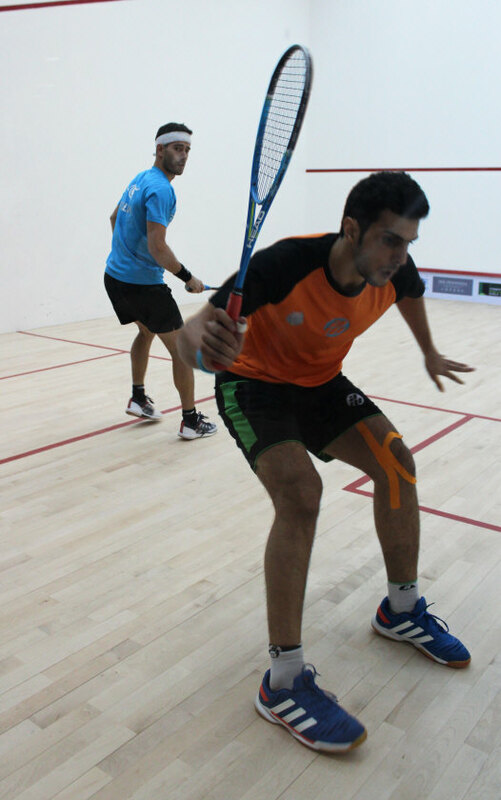 Although Mosaad led 3/1, a series of unforced errors put Marwan into 8/5 lead. 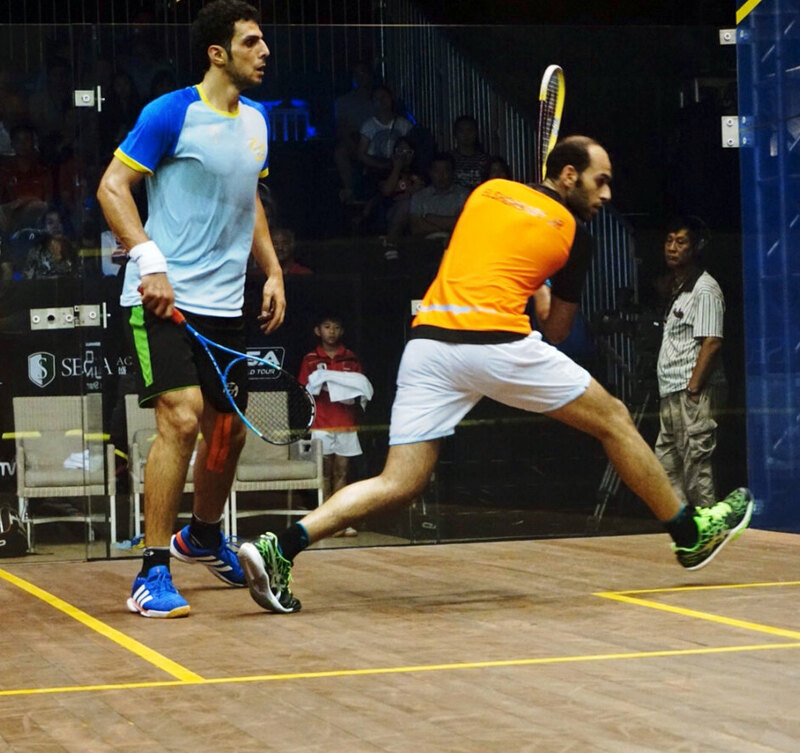 A couple of errors by Shorbagy then kept Mosaad in the game, but at 10/9 Shorbagy hit a winner to draw level. 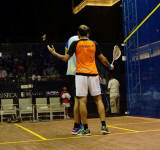 The third game, in which Shorbagy repeatedly addressed the referees, brought about the first tiebreak of the night. 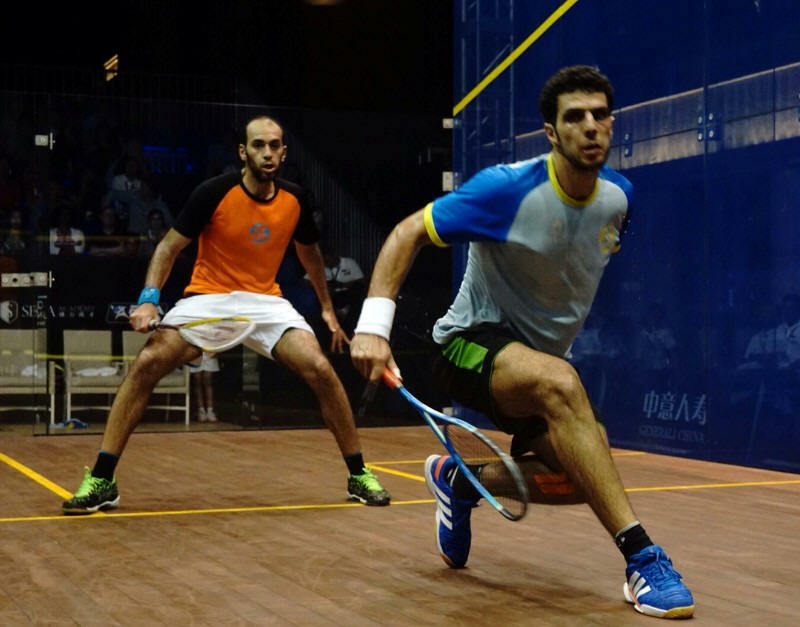 Shorbagy led 8/6 before Mosaad winners gave him two game balls at 10/8. He had another at 11/10 before Shorbagy took a 2-1 lead 14/12. Shorbagy continued to be at odds with the referee, but in the fourth Mosaad led 6-3, was never behind and levelled the match 11/8. A collision at 2/1 in the fifth caused a blood injury to Mosaad, and he led 7/5 on return. 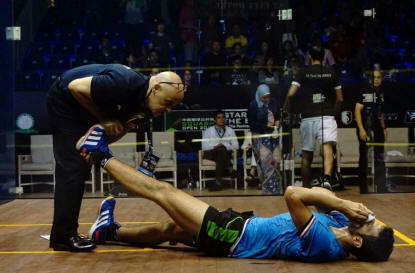 At 8-all Mosaad, who had hardly said a word all match, collapsed with cramp and was clearly in agony, and the match was over. Gohar downs David as Marwan takes revenge on Max - and Leo marches on ! 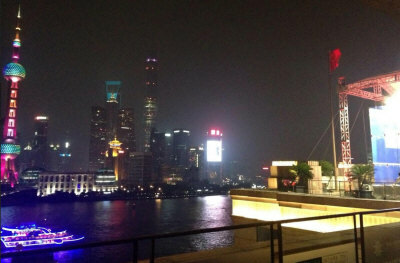 The quarter-finals of the China Open in Shanghai saw another massive upset, and revenge of sorts for an earlier one. 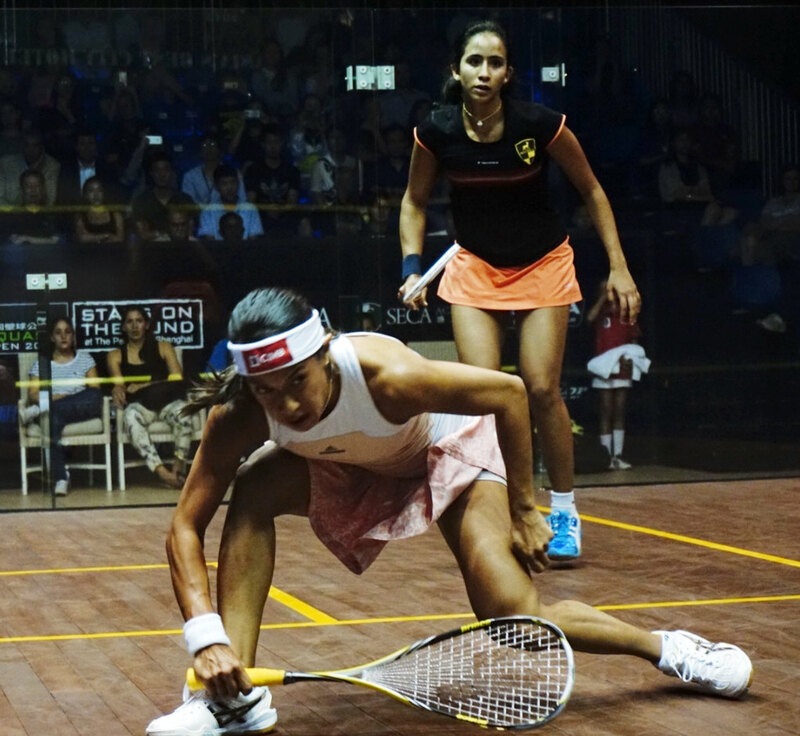 Egypt's world junior champion Nouran Gohar stunned top seed Nicol David as she recovered from losting the first game to beat the eight-time world champion who lost her nine-year grip on the world number one position just this week. 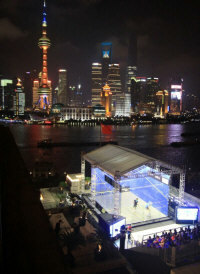 "It was a clean and intense game, with lots of long rallies," reported Chris Wang, on the spot in Shanghai. 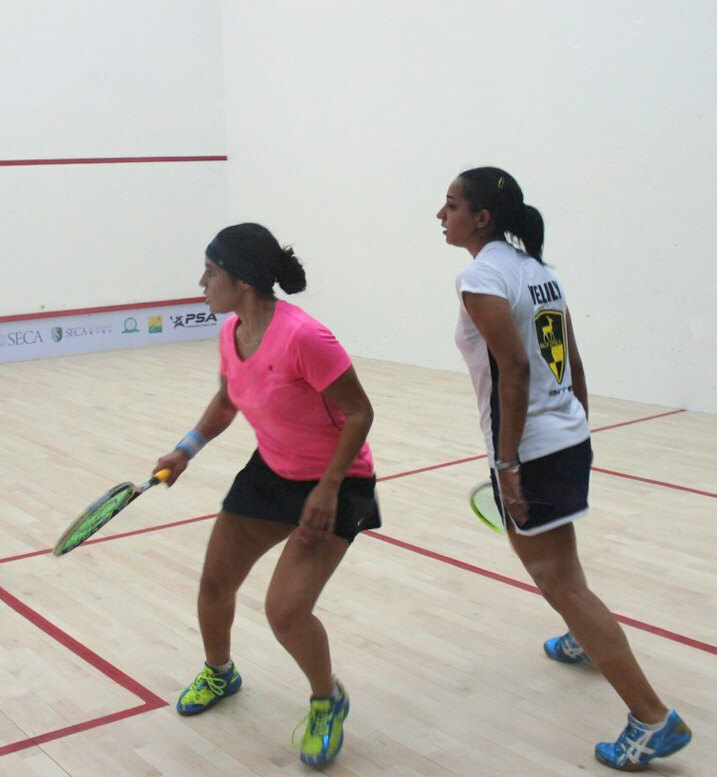 "Gohar was purely Egyptian way, non-stop attacking, and David struggled to cope with her pace." Gohar will meet France's Camille Serme for a place in the final after the Frenchwoman beat Sarah-Jane Perry in three close games. 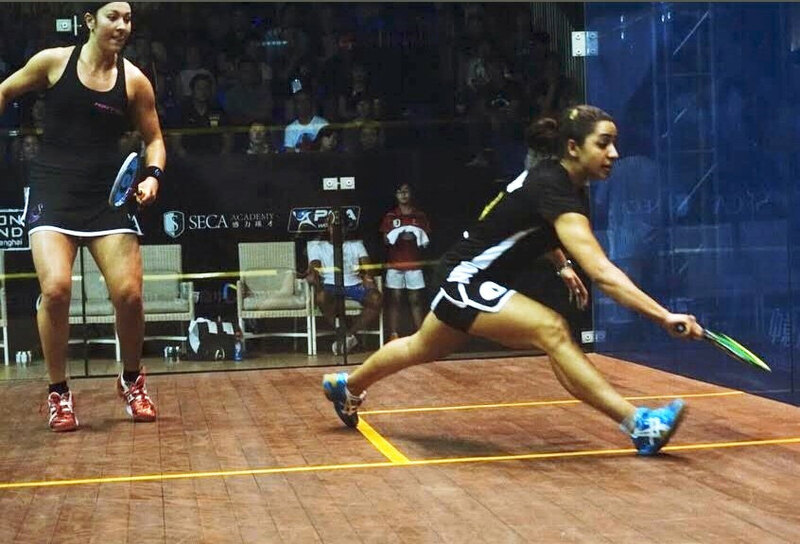 In the bottom half of the draw new world #1 Raneem El Welily benifitted from a less than fully fit opponent, Annie Au retiring after two quick games, while the USA's Amanda Sobhy ended English interest by beating Emma Beddoes in straight games. 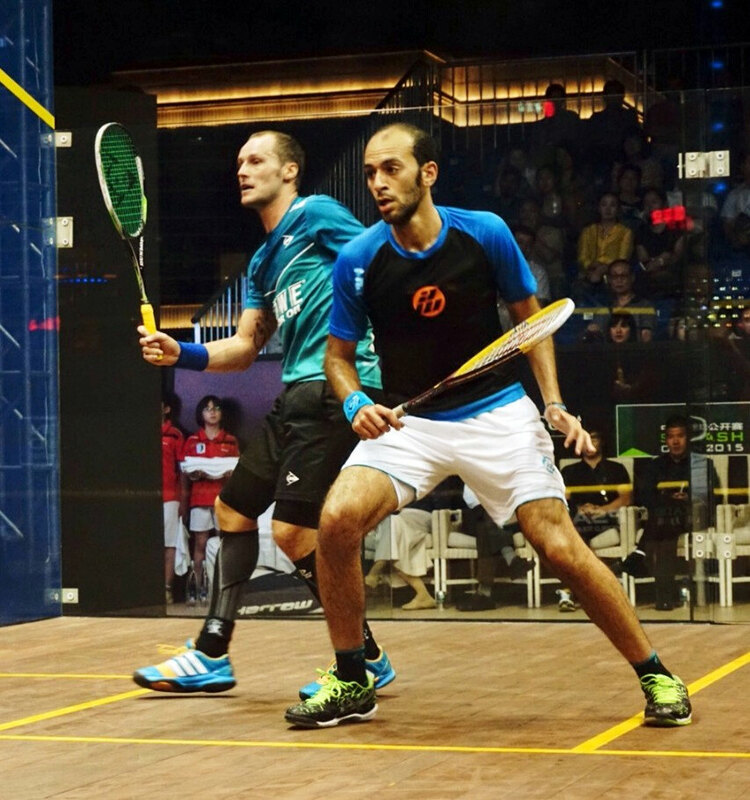 In the men's draw unseeded Marwan El Shorbagy advanced to the last four with a straight-game win over Max Lee, who had sensationally beat his brother and top seed Mohamed in the previous round. "The first two games were close but Max just couldn't get the final points," reports Chris. "Lee was winning points with his volleydrop, but overall Marwan was just too fast." 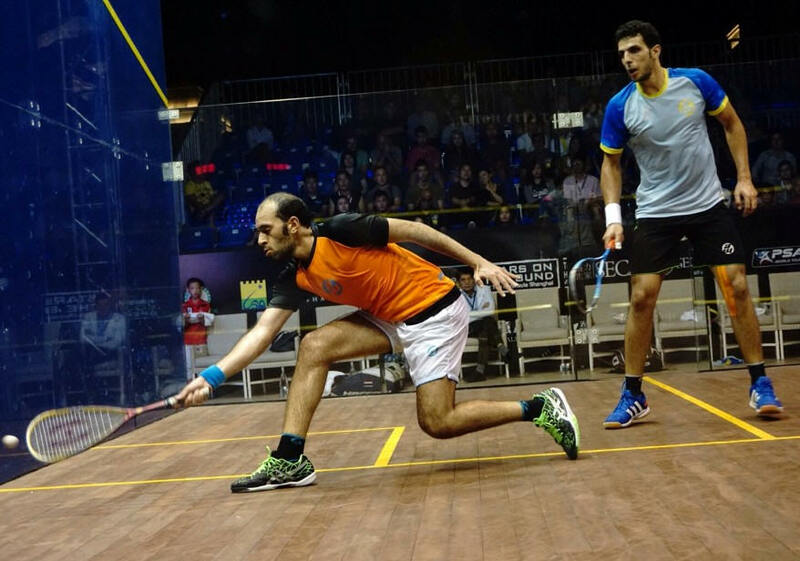 Marwan now meets fellow Egyptian Omar Mosaad after the fourth seed bat Borja Golan in four games. Second seeded Frenchman Gregory Gaultier maintained his run ov victories over Tom Richards - "feels like I've played him 100 times and haven't won a game yet," tweeted the Englishman before the match. It wasn't to be 101st time lucky, but Richards felt he was "close to getting that game and easily the best I've played against Greg." 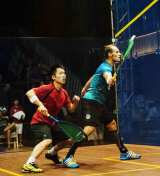 Gaultier will face a surprise opponent for a place in the final after Hong Kong qualifier Leo Au produced a thirs successive upset as he beat seventh seed Mathieu Castagnet in four games. 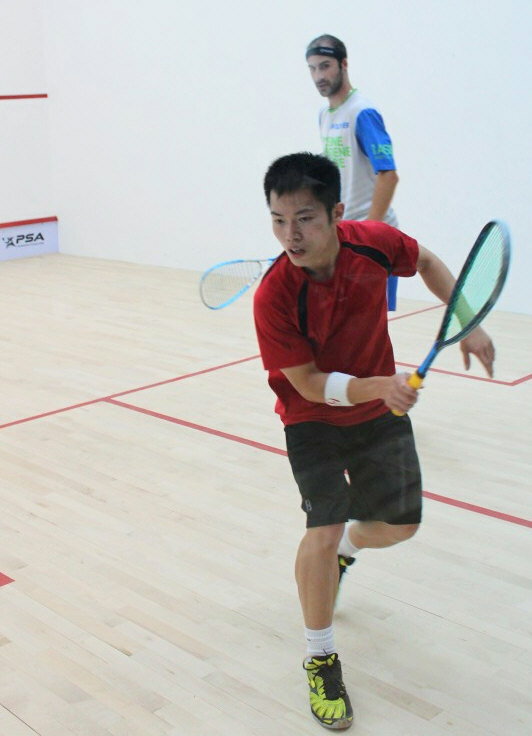 Hong Kong's Max Lee and Leo Au produced massive upsets in the first round of the $100k event at the SECA Academy in Shanghai as they removed top seed Mohamed Elshorbagy and third seed Simon Rosner. Lee twice recovered from a game down before beating world #1 Shorbagy in a 72-minute five-game battlew, while Au, having already beaten defending champion James Willstrop in qualifying, accounted for world #7 Rosner in four games. Lee now faces another Shorbagy after Marwan upset fellow Egyptian Tarek Momen, the sixth seed, in straight games, while Au meets France's Mathieu Castagnet who ended the run of qualifier Greg Lobban. The other quarter-finals see Omar Mosaad take on Borja Golan while second seed Gregory Gaultier meets qualifier Tom Richards, who provided the fourth upset of the round as he beat fellow Englishman Peter Barker, seeded fifth, in straight games. 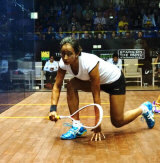 First round action in the women's draw saw seven of the seeded players progress to the quarter-finals, and an upset win for Egypt's world junior champion Nouran Gohar. 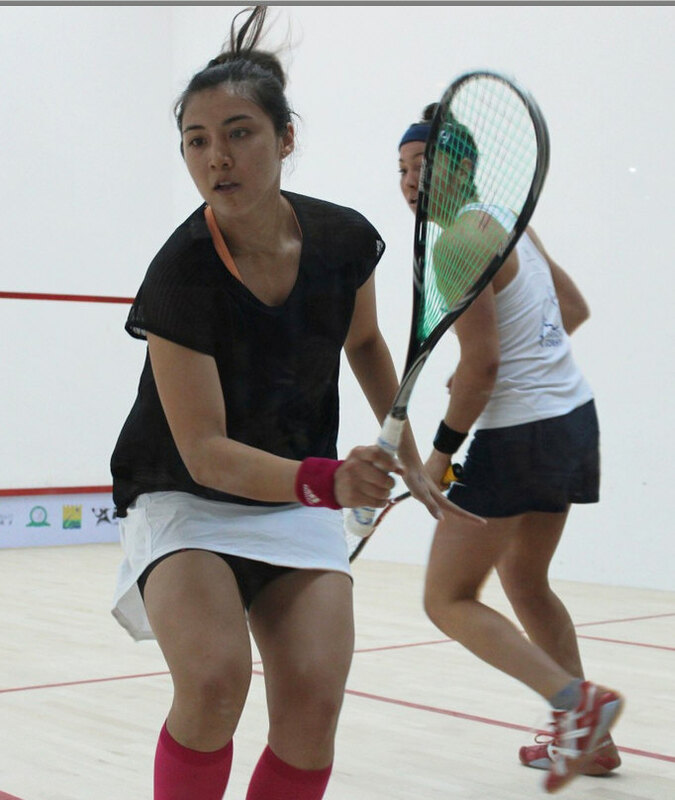 Gohar beat New Zealand's Joelle King, returning to action after an extended injury break, in straight games to set up a quarter-final meeting with world champion Nicol David, the top seeded Malaysian who beat French qualifier Coline Aumard in four games. 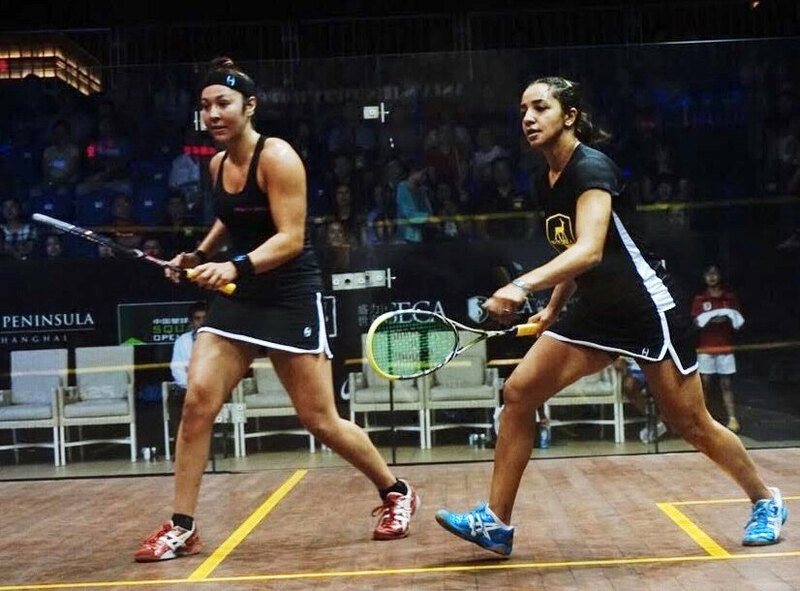 Also dropping a game, new world number one Raneem El Welily, seeded two, recovered from losing the first game to fellow Egyptian Heba El Torky to advance to the quarters, where she will meet Hong Kong's Annie Au, the fifth seed who beat former world champion Rachael Grinham in five games. 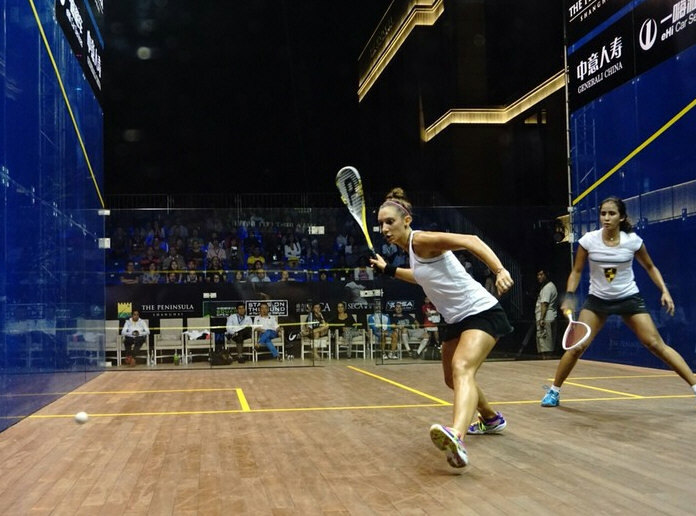 The other quarter-finals, to be played on the all-glass court on the Shanghai waterfront, see Camille Serme take on Sarah-Jane Perry while Amanda Sobhy meets Emma Beddoes. There were signs yesterday that all was not well with last year's China Men's Champion James Willstrop, and although he played better in lots of areas, he still went out to Hong Kong's Leo Au. Although Willstrop began brightly, Au played well to win the first game 11-5 and then establish a 2-0 lead after a close second game. Willstrop was unhappy at some of the refereeing decisions and Au's reluctance to play the ball didn't help his disposition. However as Au struggled to maintain pace, Willstrop drew level and at two-all looked the more likely winner. To Au’s credit he attacked successfully, led 6-2 and although Willstrop recovered to 5/6 Au drew away to win 3-2. 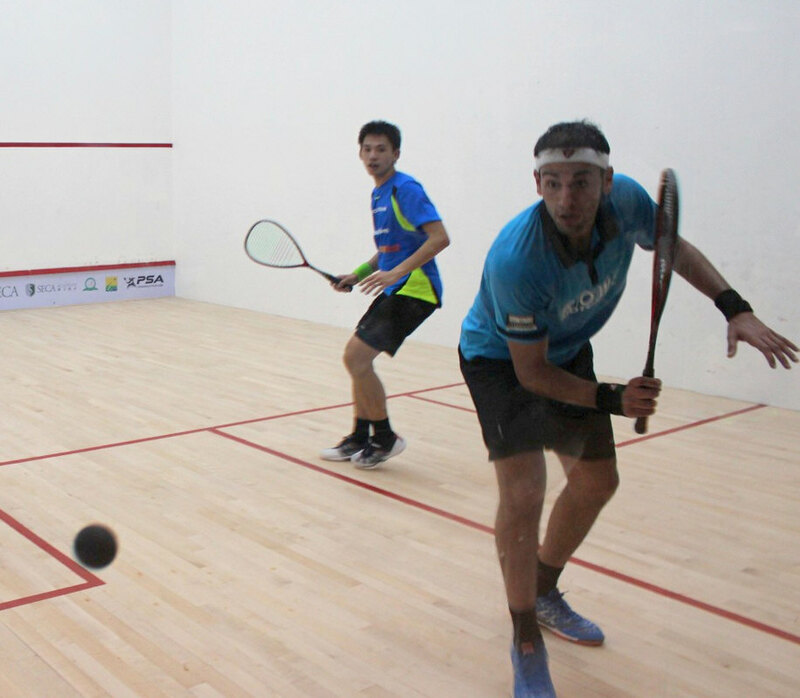 The second men's match saw another upset as young Scot Greg Lobban beat Nicolas Mueller in five, and while Tom Richards and Saurav Ghosal both justified their seedings with straight-game wins, neither was easy. 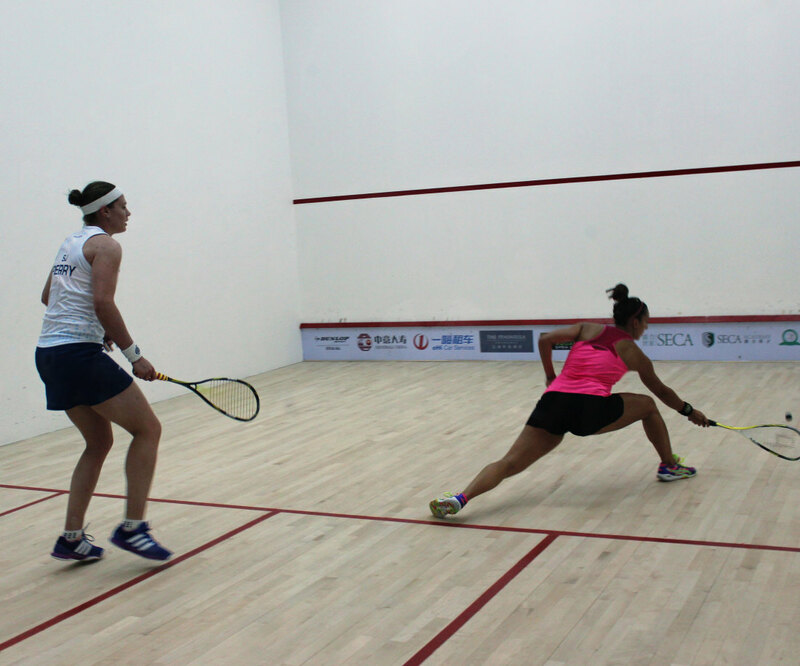 Doanna Urquhart was the third player to defy seeding when she beat Salma Hany Ibrahim convincingly 3-0. The first game was close with combinations of winning and losing shots, but it was the more persistent Australian who won it 12-10. From then on she always looked the more probable winner, chasing up well and making winner of her own. Hany had a distracted look, almost accepting the inevitable, but Urquhart will be well pleased not just with the win, but the manner in which she achieved it. 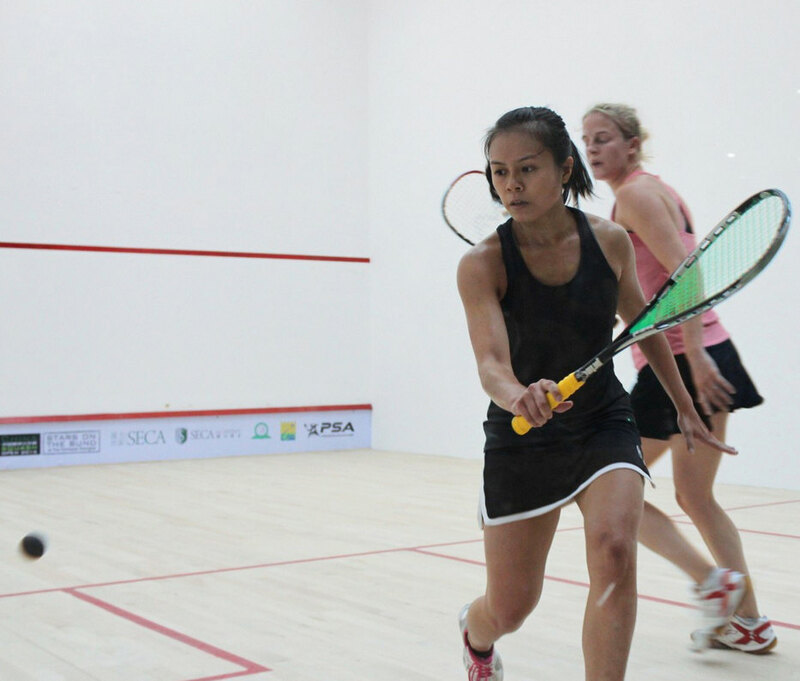 In the other women's matches Heba El Torky beat Misaki Kobayashi in five games, Delia Arnold came from a game down to beat Tesni Evans, and France's Coline Aumard finished the day with another upset as she beat Emily Whitlock in three close games. The 2015 edition of the China Open gets under way today in Shanghai, with 2014 Champion James Willstrop top seed in the men's qualifying event! He began his defence at the SECA Academy, first match on, against James Huang and it turned out to be no easy matter. 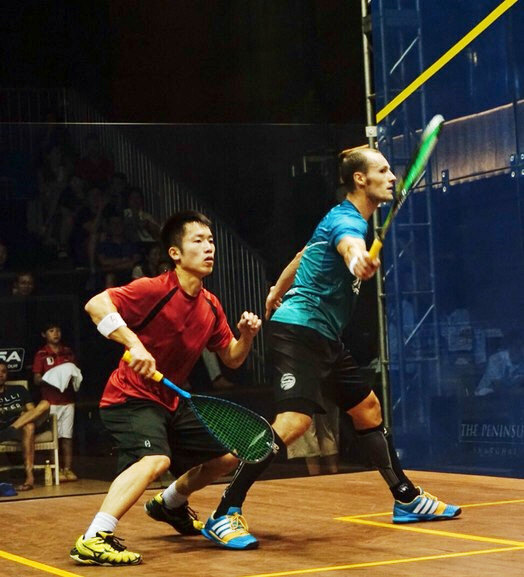 Huang is very athletic and whilst Willstrop seemed distracted and ill at ease, that should not detract from the quality of Huang's squash: he played accurately, moved very well and gave little away. Add to that he played every ball, looking for nothing. 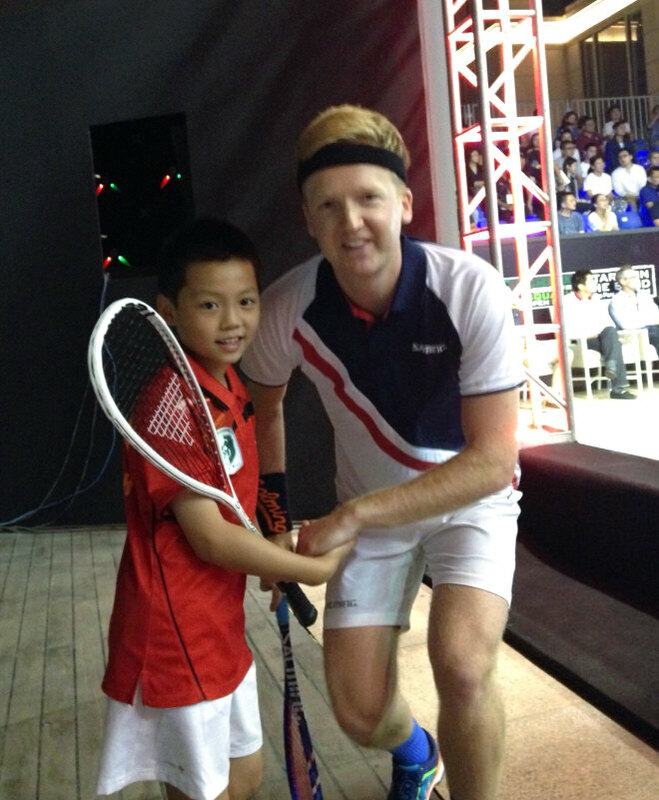 Willstrop struggled from halfway in the first game, lost interest and Huang led 1-0, 11-6. The second was close but WIllstrop levelled 11-9, took a 2-1 lead 11-6, but they had to battle all the way to win the fourth on a tie break 12-10. It was an unconvincing performance from the holder of the championship performance from the holder of the championship and he will need to improve to make an impact. 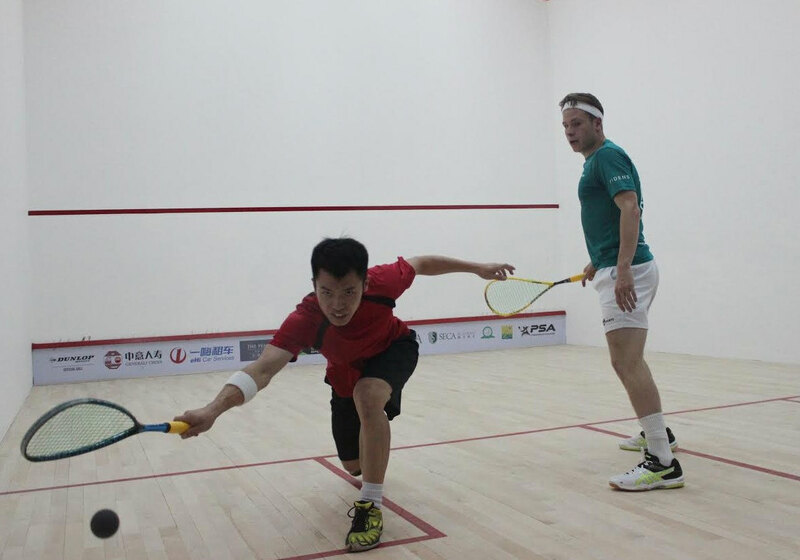 The second men's match was between Hong Kong's Leo Au and Englishmen Charles Sharpes. The first game was well enough contested, au winning it 11-7. In both the second and third he took long leads and although Sharpes fought back from 6.0 down in the fourth to 5-8, he lacked the persistence to trouble Au, who took the second 11-2 and the third 11-5. Unlike Huang, who played everything, Au was let conscious, the only downside in a convincing enough display. There was a disappointing ending to what had been a very watchable match when Milou van der Heijden took a heavy fall in the front left corner, turning her ankle. At the time the score was one all, with Heba el Torky looking much more composed than this time last year. The Egyptian won a well contested first game 11-7, but when she lost her accuracy in the second the Dutch girl led 9-4 and although El Torky got back on course, the score was level, one all, 11-8. El Torky carried on where she left off in the second and led 6/3 when van der Heijden fell. She tried to resume after treatment but it was seem clear that the task was impossible. Other winners in the first session of play were Greg Lobban, Nicolas Mueller, Delia Arnold, Tesni Evans and Misaki Kokayashi. The second session of play also saw the seeded players progress, with England's Tom Richards the only on to drop a game. 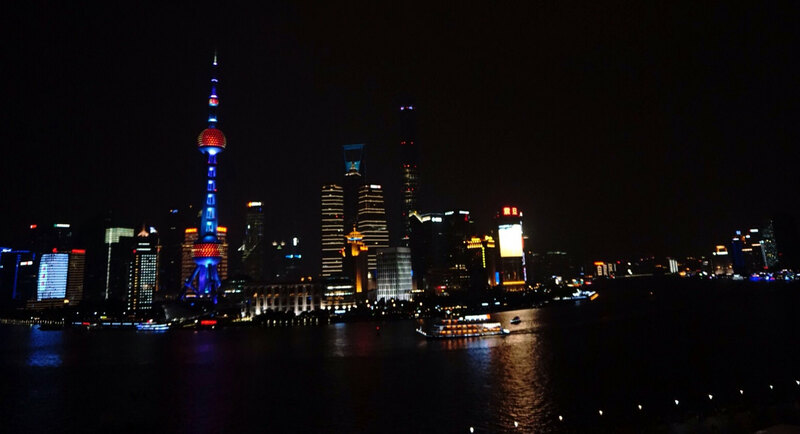 It's a long haul from Pontefract to Shanghai, but travelling Cathay Pacific eases the pain. 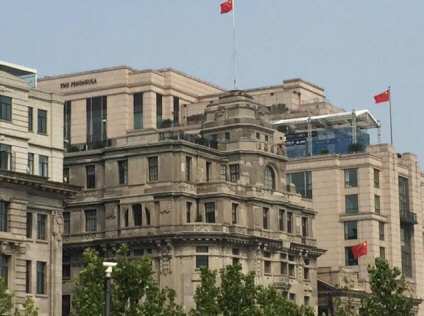 Being met by Katelyn and talking to Franco reminds me of 2014's wonderful event and finally arriving at the sumptuous The Peninsula complete matters. 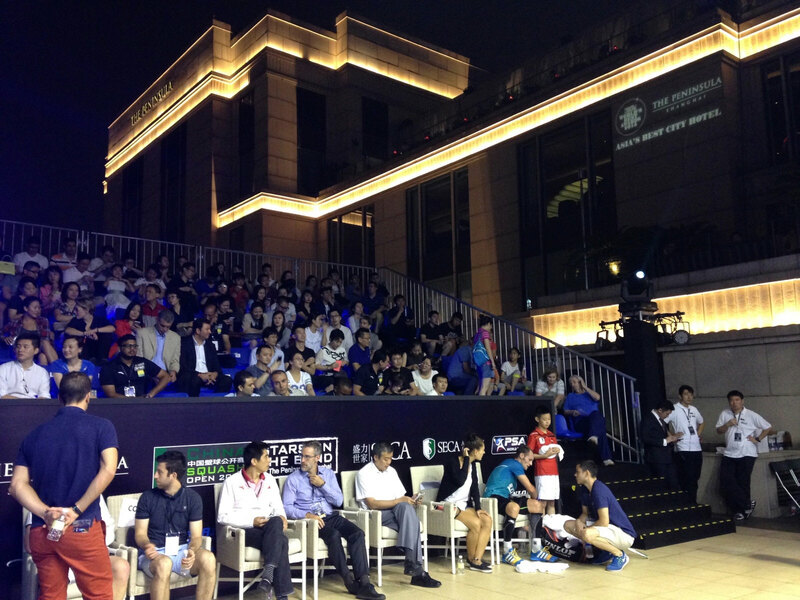 The court is spectacularly sited on the 11th floor and under construction and the qualifier begin at the SECA Academy, the headquarters of China Squash. Franco and his team have been well rewarded with no 1 Mohamed El Shorbagy heading the draw and seeded to meet world no. 3 Gregory Gaultier. 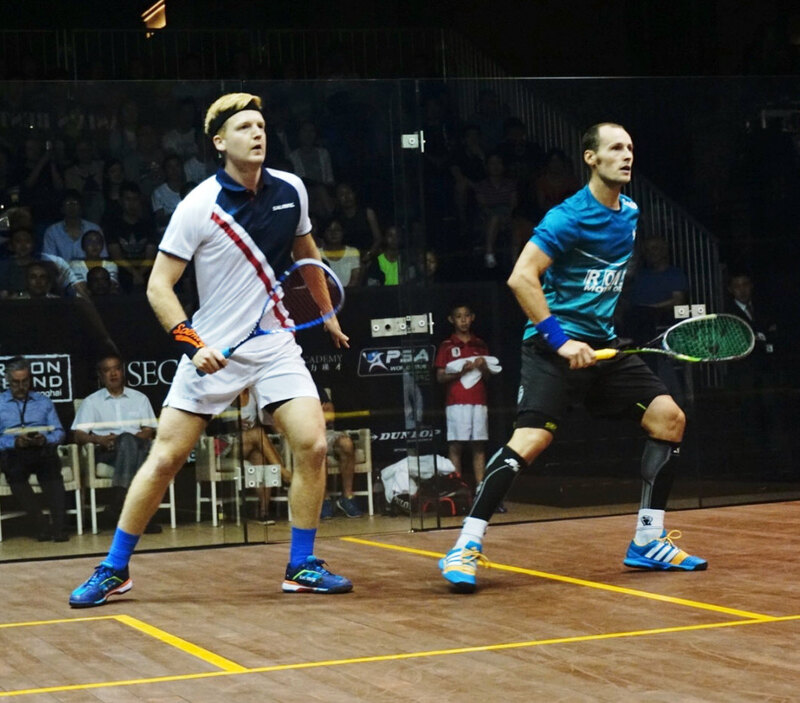 There is strength throughout the draw and with such in James Willstrop and Saurav Ghosal in the qualifier, no-one can take anything for granted. Without preempting anything, if the fist round of the China Open qualifiers go according to plan, the second phase will provide some worthwhile entertainment. 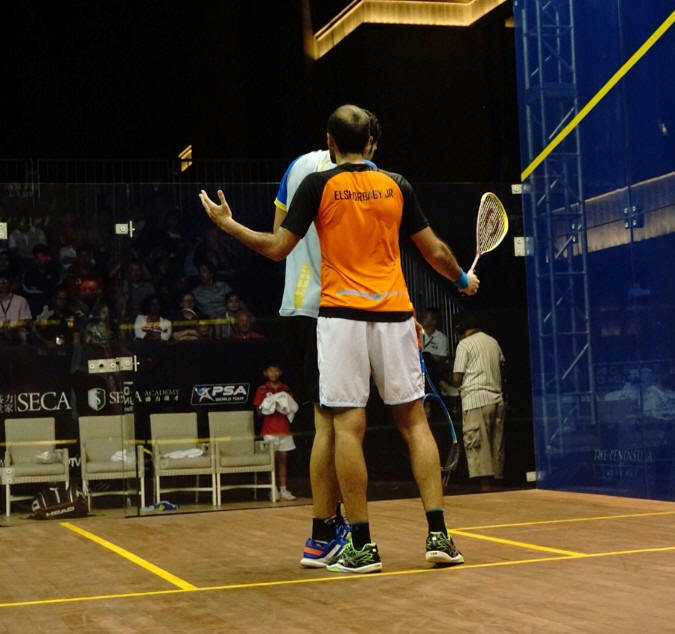 Of the men’s quarters Ghosal, who beat Miguel Rodriguez in the Colombia Open recently faces the contentious Egyptian Omar Meguid. The women’s looks just as interesting and top seed Delia Amold, who did so well in the British Open, will be tested by talented Welsh no.1 Tesni Evans. Nor will those in the first round proper be feeling so comfortable at the prospect of meeting a qualifier, as might be expected. If Willstrop，Ghosal, Nicolas Mueller, Tom Richards, Armold, Heba El Torky, Salma Hany and Emily Whitlock all qualify according to the seeding, further progress may well be on the cards for some of them. 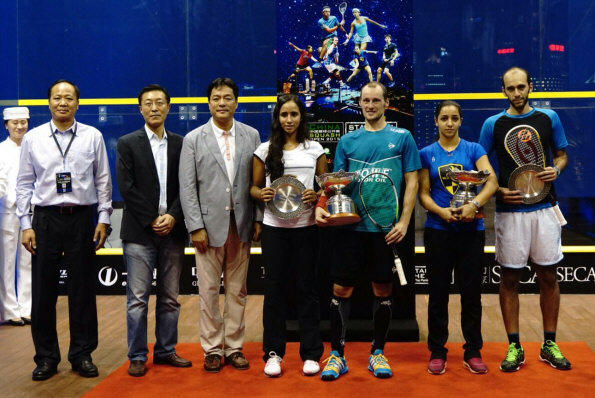 Mohamed Elshorbagy will be aiming to get his 2015/16 season off to a triumphant start when he tops the draw at the 2015 China Open, while Nicol David will be the star attraction in the women’s event. Set against the backdrop of Shanghai’s bund on the terrace of The Peninsula Hotel, the 2015 China Open will be the first ever PSA M100 tournament, offering prize money of $100,000 to the 16-man field, with Elshorbagy aiming to pick up where he left off, winning the prestigious Allam British Open at the end of last season. 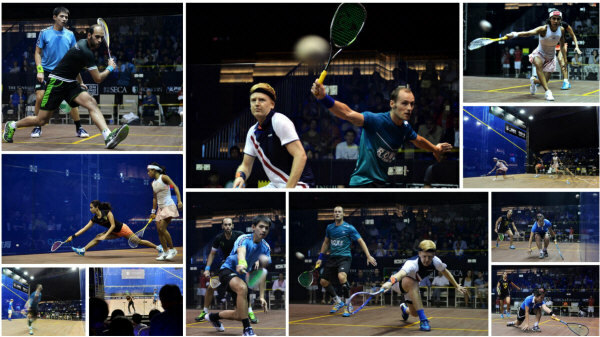 In what will be the first competitive tournament of the season for many of the world’s best players Elshorbagy is set to face a stiff challenge as he hopes to add to his 14 PSA titles, with France's world #3 Gregory Gaultier and German world #7 Simon Rösner chief contenders amongst a tough field. 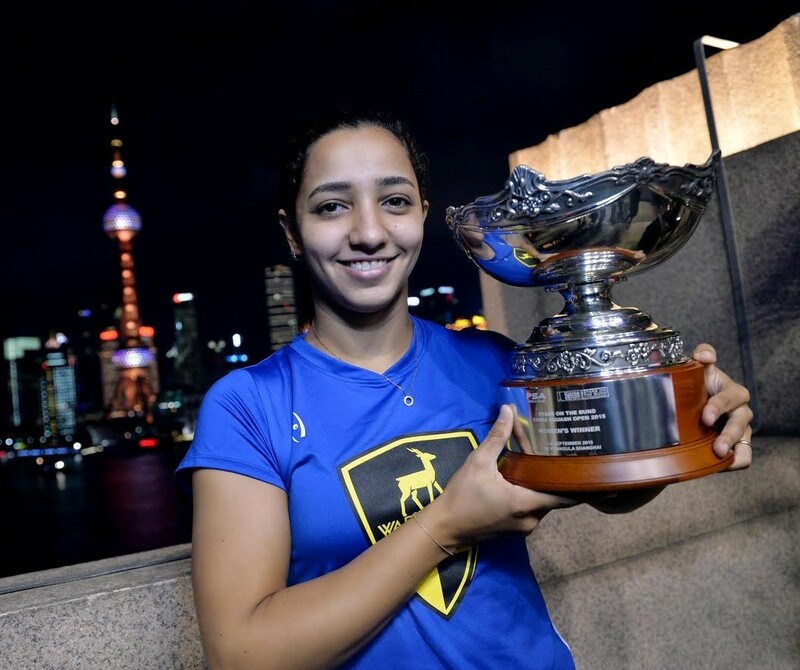 In the women’s $58k event David, the World #1 for the past nine years, will face a tough challenge from World #2 Raneem El Welily - the talented Egyptian who is currently just a handful of points behind David in the world rankings. A likely match-up in the title decider could have a significant impact in the battle to be #1, with David knowing she will have to be at her best in order to maintain her place at the top. 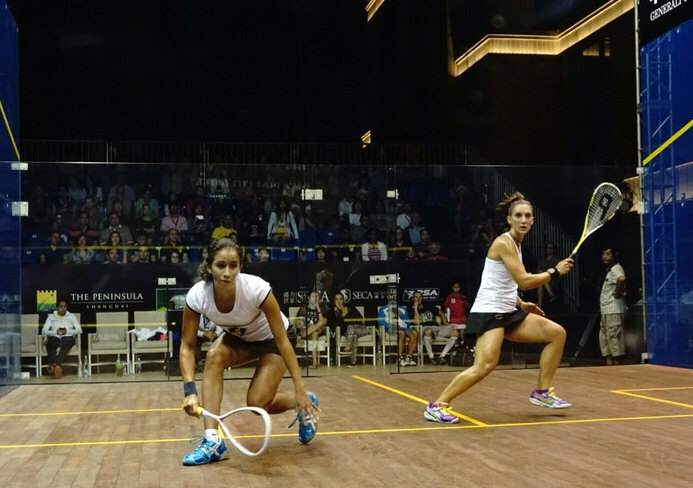 Progress to the final will not be straightforward for either player though, with the likes of Allam British Open Champion Camille Serme and dangerous American talent Amanda Sobhy amongst the challengers. "This is the second year that world-class squash, 'the preferred sport on Wall Street', will be appearing on the Bund, historically known as the Wall Street of Asia", said Mr. Sheng Li, CEO of SECA, investor and organizer of the China Squash Open." 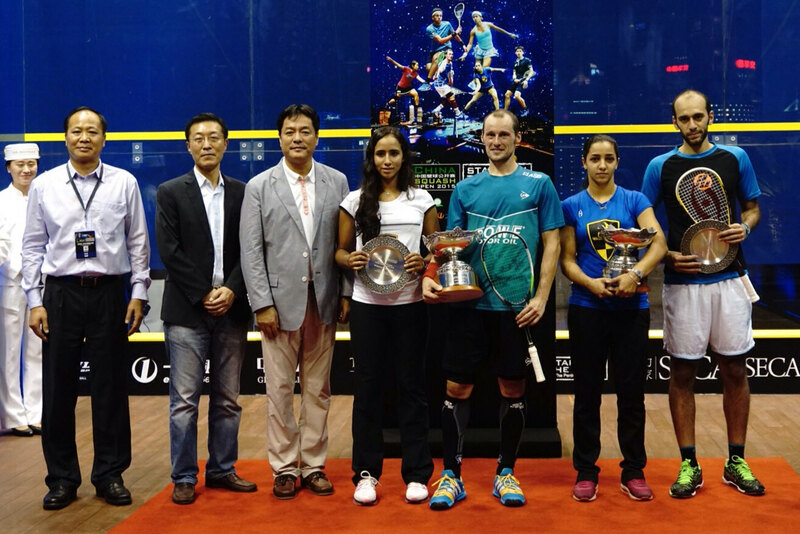 “The China Squash Open is growing bigger every year and this reflects the efforts we are making to develop squash in this highly potential market,” added Franco Amadei, China Squash Open Tournament Director and SECA Squash Academy COO.